Ajahn Vayama tells the story from the time of the Buddha of the woman who struck tragedy, but went on to become an fully awakened nun. Ajahn Vayama talks about forgiveness to close off old wounds and live happily. Having just spent time with a dying lay woman and her funeral, Ajahn Vayama speaks about how we can face dying with calm and resolution. Honoured guest Ajahn Plien, a great meditation master from the north of Thailand (Chiang-Mai region) was invited to visit the Buddhist Society of Western Australia and share his wisdom. 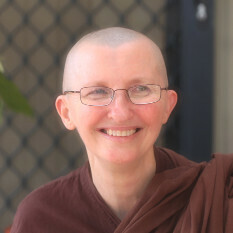 This session starts with an outline of Ajahn Plien’s past, including being a disciple the legendary Ajahn Mun and Ajahn Waerne in the Thai forest tradition. It then goes on to a session taking questions from the audience with answers translated by Ajahn Nyanadhammo. The Buddha saw family as the foundation for the development of healthy individuals and a healthy society. Ajahn Vayama talks about the role of the family and parents within Buddhist society.